Autumn had arrived at Hemingfield Colliery and the rustling silver birch leaves were glistening golden-ochre as regular Friends and volunteers Alan, John, Phil, Chris, Nigel, Amanda and Site Director Glen met at the start of another working weekend. Cheery greetings, and conversations catching up with the individual mine-related projects being pursued by the regular volunteers, could be heard around the site on this sparkling October day. Hemingfield Friends and volunteers include a geologist, an educationalist, a mine ventilation expert, engineers, a librarian and archivist, social historians, archaeologists and an artist/illustrator, all of whom are contributing their knowledge and expertise to research, understand and share the Hemingfield Colliery site and its history. Eventually, the talk turned to the tasks of the day. On this particular day, the team were anticipating a visit from Peak Park archaeologist John Barnett, who was coming to discuss an archaeological strategy for the site with regular site volunteer and professional archaeologist Nigel. After a brief discussion about archaeological progress so far and the equipment on site, John and his team soon got stuck in with cleaning the previously excavated stone feature, which runs along the roadside frontage of the site. 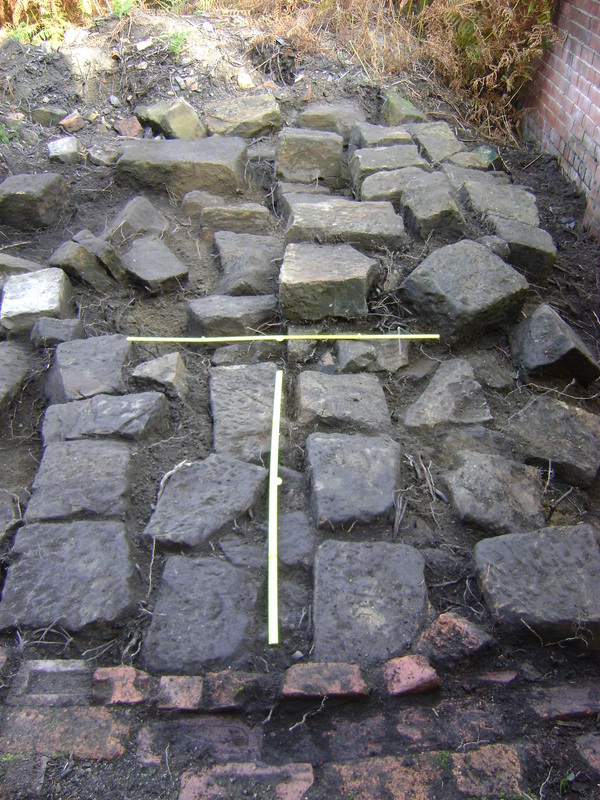 This feature is thought to relate to the demolished Victorian engine house, but further excavation is needed to confirm this. As Glen and archaeologist Nigel hot-footed to the local hardware store for extra tools for the visitors, John and Alan, Phil and Chris were soon busy with pickaxes and spades, removing topsoil, foliage and some very stubborn roots, as they continued with the back-breaking clearance work on the south-west side of the switchgear building. Friends Chair Steve soon arrived to join in. 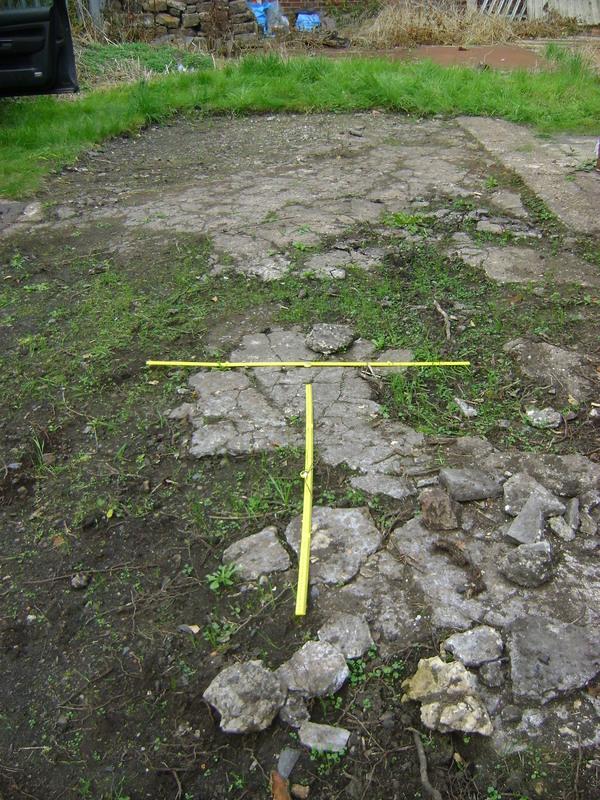 This work revealed a modern concrete layer which was recorded and photographed before being removed. Hopefully, more exciting archaeology lurks beneath and will be revealed during future working days! Meanwhile, Amanda began to sort previously excavated archaeological finds into materials categories, before identifying, cataloguing and labelling some of the more interesting and significant objects. 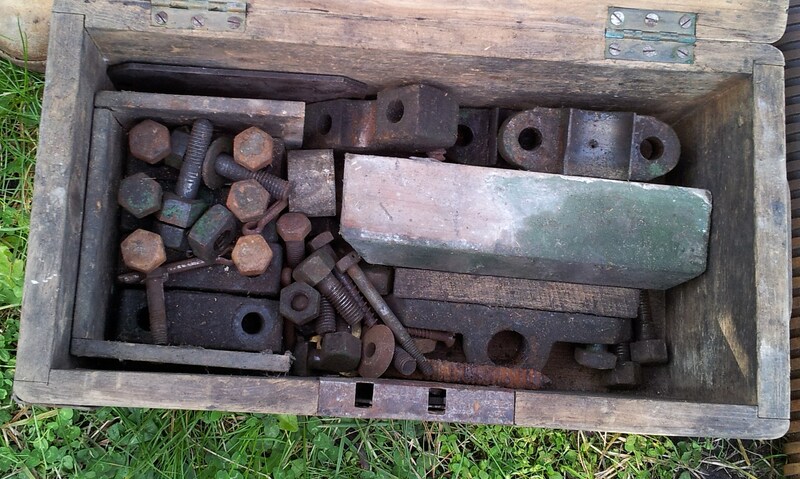 Examples of excavated finds include an iron podger, a Bakelite fuse box cover, a metal shunter’s hook, a copper earthing rod, a glass bottle labelled Compo (complete with congealed contents well past their sell by date!) and a metal alloy hand-crafted heart-shaped hook. Each of these items can tell us something of the history of the site, shining a little light on the different phases of the industrial life of the colliery, as well as on the myriad uses to which the buildings and structures have been put since the sites closure as a working mine. A podger is a tool with a wrench at one end and a point at the other. Often used for erecting scaffolding, the pointed end is used to align bolt holes, whilst the wrench tightens the nuts. This tool could have been used and discarded on the site during any phase of the building work. The metal shunter’s hook would once have been attached to a wooden pole and used to unhook and hook wagons together on the mine railway. The Bakelite fuse box cover probably dates to the re-modelling of the switchgear building in the 1940’s. We can only guess at and imagine the fascinating stories that may lie behind some of the excavated items. For example, by whom and for who was the carefully hand-crafted, heart-shaped hook made? It is a rather sweet item, suggesting the application of traditional craft skills and showing all the attention to detail to be expected of an individually-made object. Its romantic form suggests a beauty of feeling quite at odds with the industrial surroundings and mass-produced utilitarian items amongst which it was found. The many and varied excavated finds now lie stacked in boxes and finds trays, labelled and catalogued according to location area and archaeological context. It is hoped that one day they will interest and fascinate once more, perhaps displayed in glass cases in the repaired and refurbished buildings of the planned heritage centre on site. After a quick lunch, as John, Alan, Phil and Chris continued their ground clearance and Amanda carried on sorting and cataloguing finds, site directors Steve and Glen and archaeologists Nigel and John convened for the eagerly-awaited archaeological strategy meeting. Having clarified the approach to take, all agreed that the next few working days will be crucial in unravelling the complex sequence of archaeological features revealed on the north-eastern side of the switchgear building. In particular, establishing the relationship between the various structures and the yard surfaces that have been revealed will be instrumental in establishing the phases of building development across the site. The Friends are incredibly fortunate to include in their number members who were active in trying to save evidence of the mining industry from the 1970s onwards. From photographs , notes, and documents, to a willingness to preserve, transport and store machinery from the dying days of British Coal, we are extremely lucky to be in a position to actually bring back to site relics of Hemingfield’s past. This is particularly important for us at Hemngfield, a site which has suffered from significant vandalism and theft in recent years. Friends Chair Steve spread curiosity and delight to the volunteers when he produced a number of links to Hemingfield’s past, including an apparently unremarkable stool, and some heavy metal, with bits and pieces stored neatly in a box. 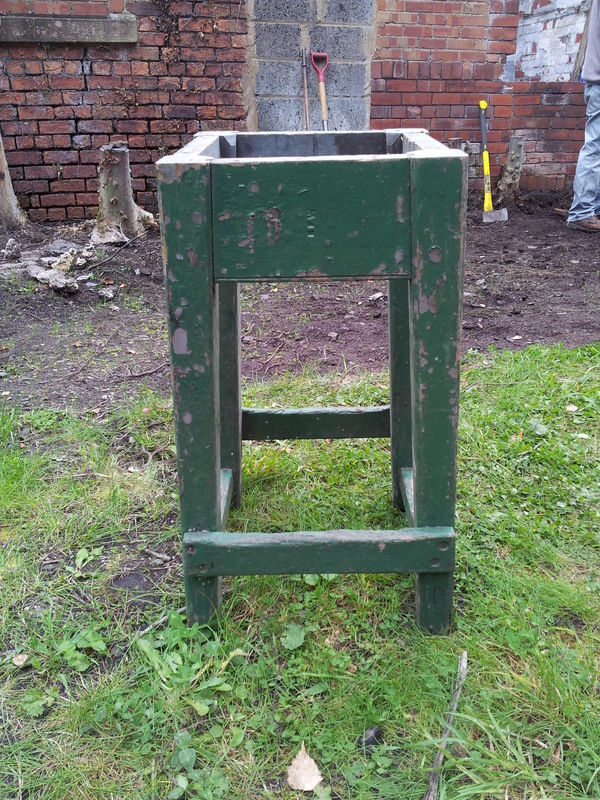 The stool is intriguing and evocative of the site’s past. Well-made with simple but solid joinery work, it is painted an unmistakeable shade of Wentworth green – the colour found across the estates of Earl Fitzwilliam, even today. In addition, it has the initials EFW marked into the body -indicating it dates from the days prior to May 1920 when the Earl ran the pit. So here we have a link to the coal working days of the pit, a very human, everyday object that links us to the busy lives of working people at the pit. Next Steve appeared to extract a great metal weight from his car – what could it be? Together with it came a box of what local folks sometimes refer to as ‘tranquilments’ – all the necessary nuts, bolts, bearings and blocks associated with the mechanism. So, an immense endless metal screw, with a white indicator point. Laid out on the ground with some of the brackets and bevel gear it looks even odder. What is it? What is it for? How did it work? It is part of the electric winding indicator board layout – the pointer travelling horizontally rather than vertically to indicate depth within the water shaft – “Top”, “Kent”, “Bottom” indicating the main levels in the shaft. What a wonderful piece of machinery. The friends are delighted to safeguard this and other relics belonging or associated with the site, and are dedicated to preserving and restoring whenever possible.